Good Monday Morning! What did you think of the Sneak Peeks? Which die(s) are your favorite? For me, its got to be the Labels 1, we’ve been asking for that one for a long time. I tend to favor the more general shapes that are versatile, instead of the more specific. I also like to use dies beyond their obvious shape. I used the Labels 2 die as an object, not a label, in a project for this week’s show, I’ll be able to post that picture next week. Today I’m sharing a bracelet I made using shrink plastic and Spellbinders dies and stamps, Copic Markers and Krylon leafing pens, among other trinkets and baubles. I found the bracelet base on sale at Kohl’s a year ago and have kept it in my stash waiting for inspiration. Some of the items are 7 Gypsies (oh, do I love 7 Gypsies! ), a typewriter key, and watch parts. I used my Wizard to smash the bottlecap, filled it with loose watch parts and filled in with Glossy Accents. I punched the hole with my Crop A Dile. I used tags and rectangles to cut the shrink plastic (Lucky Squirrel brand), stamped the Spellbinders stamps with pigment ink and colored in random spots with Copic Markers. The stamps I used were parts of a butterfly, the wreath stamp and one from the clock set, going for more of an abstract pattern than actual shapes. I shrunk it with my heat tool and colored the backs and sides with Krylon paint pens to make it look more like metal. While the Copic markers go on semi-transparent, when shrunk they look much more intense. I’m off to clean my house and get myself ready for CHA in Rosemont IL this week. If you are attending, please stop by the booth to see ALL the artwork from the Sneak Peeks, ALL the new dies, including dies that were not included in the peeks, and a few of the artists, including me! Spellbinders is booth 3909. 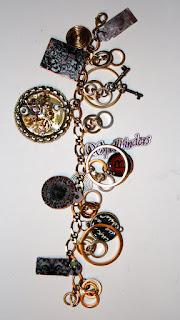 This entry was posted in Spellbinders and tagged bottle cap, bracelet, shrink plastic, Spellbinders, stamps. Bookmark the permalink. The bracelet is beautiful! You did a fantastic job on it, Beth. I would never think to use shrinky dinks to make a bracelet. You’re so creative! !